When you speak, people listen. Sometimes, the wrong people—political opponents, investigative journalists with hidden cameras... exes. So suffice it to say, there are times when you'd rather your conversations went unheard. 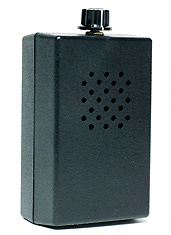 Enter Audio Jammer, a handy little black box that renders your clandestine conversations all but mute, available now. Think of this as a pop-up soundproof booth that fits in your pocket. Let's say you're meeting a colleague at Cafe Milano to compare notes on your party's looming scandal (you never should have left that intern unsupervised). In the corner, you notice that WaPo reporter who's been hounding you—that's when you pull out this tiny box and turn the knob, and it begins emitting a quiet white noise, randomized to throw off any electronics-toting eavesdroppers (you know they're out there). When you get to the juicy part (the part involving the congressman's unique late-night use of the Old Supreme Court Chamber), you can rest assured that your cone of silence extends 150 square feet, about as big as your office. It even works outdoors, should you be planning a park bench rendezvous with a former KGB agent sometime soon.